Spitbank Fort is one of four forts built in the Solent as part of the 1859 Royal Commission to protect Portsmouth’s dockyard from a possible French invasion. They formed the most expensive defensive system undertaken by Britain during peacetime. By the time the forts were completed all perceived threat to Portsmouth had passed, and because of this the forts became known as the Palmerston Follies, named after the Prime Minister at the time, Lord Palmerston, who had defended the enormous build cost. 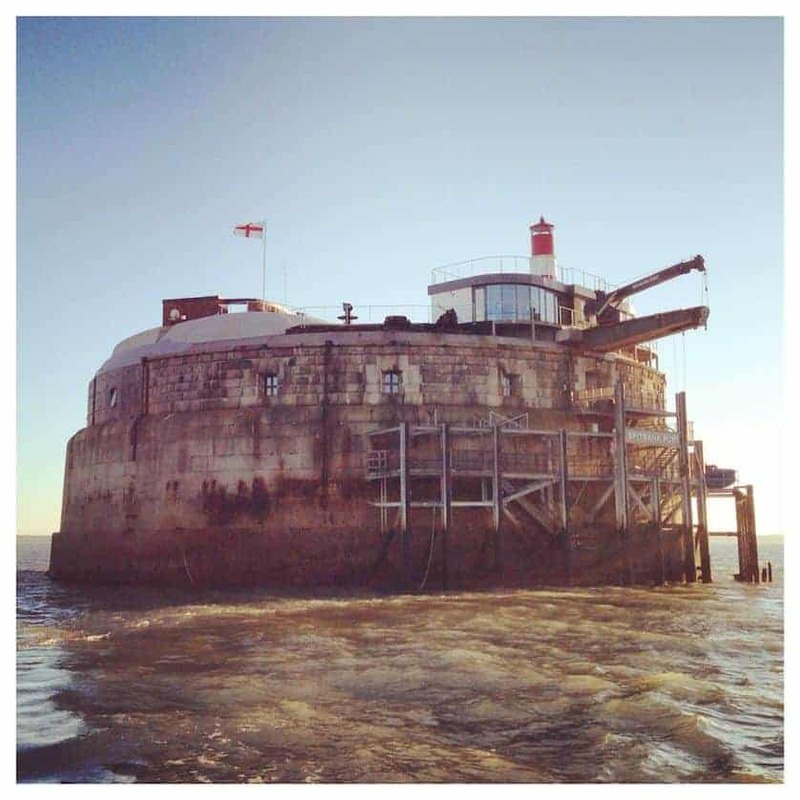 In 2012, 142 years after the completion of Spitbank fort, the current owners AmaZing Venues transformed this ancient fort into an exclusive super-luxury 9 bedroom hotel. Guests can opt to spend the night in one of the 9 unique bedrooms, or enjoy day trips, such as their Sunday Lunches, which I have recently experienced. The fort is an amazing venue for private parties and weddings. The day started at around 11:30 at their luxurious departure lounge in Royal Clarence Marina, Gosport. After check in we were offered coffee or tea while we waited for the rest of the guests to arrive. During this time we were also shown the wine list so that we could pre-order our wine for lunch. Once all the remaining guests had arrived we were escorted out of the departure lounge and to their boat in the Marina. Once we were all comfortably seated on the boat we started out on our 30-minute transfer out of Portsmouth Harbour, and across the Solent to Spitbank Fort. On arrival we had to wait a few moments for a calm between the waves, and as soon as we could, the boat docked at a small jetty against the northern face of the fort. We left the boat and climbed a few flights of stairs to the main fort entrance: a huge original wooden door, surrounded by a stone archway. We stepped into a grand, military-style hallway packed full of Victorian naval memorabilia, and greeted with a glass of champagne and welcomed into the stunning Victory bar. The main area of the Victory bar is set out in a number of the original cannon ports, and the original hooks and fixings for the cannons are still visible on the ceiling. Off the main room are other small seating areas facing into the centre of the fort, and these rooms are the original washrooms for the soldiers who would have been stationed here, as well as small offices for the officers and other important people based on the fort. After enjoying our champagne and relaxing in the beautifully restored Victory bar, we were split into 3 smaller groups and taken on a tour around the remainder of the fort. Our group started up on the roof, and we were shown the leisure areas such as the fire pit, sauna and hot pool as well as the rooftop bar which doubles up as the best suite in the fort. The views from up here were amazing, and you could see nearly the whole of the Solent from Gosport to Selsey, as well as much of the northern coast of the Isle of Wight. From here we went down two floors to the basement level and we were shown another small bar area, massage rooms and games rooms. On this level there were also some rooms left in their original state, such as the original kitchen where the meals were prepared for the soldiers. During the tour we were given a brief history of each area, and its role when it was an active fort. We were not shown the bedrooms, which is understandable as they were all occupied. However, if there is an unoccupied room on the day maybe it could be added to the tour – as I’m sure this would inspire people to spend a night in the future! Once the tour had finished we were all escorted into the officers’ mess and shown to our allocated table. We were seated on a table for 8 people, along with a few other couples (private tables can be pre-booked). We introduced ourselves and chatted with the other guests while the waiting staff brought our wine to us. This was quickly followed by our starters; I opted for the goat’s cheese which was absolutely delicious. Then on to the main course of roast Hampshire rump, beautifully cooked and presented. Without a doubt the best Sunday roast I have had for a long time! I was so full by this point but recalled that a friend had told me, that you have a separate stomach for desert, with this in my brain, I had no problem enjoying the divine crumble that followed. We then had a couple of hours to explore the fort further at our leisure, and so we took this opportunity to have a good look around, especially at the bolt passage which is a small corridor that travels around the circumference of the fort. The outer wall of the fort was designed with small holes in, that would aid the fitting of additional iron armour plating should it ever be needed, by bolting it on from this passageway. During this time complimentary tea and coffee were served in the Victory bar, and this bar and the bar on the roof were both also open to serve any other drink, at cost. We also explored the rest of the original areas on the basement level before enjoying an exquisite Barbadian rum in the sun at the ‘Crow’s nest’ rooftop bar. Before we knew it the boat had arrived and it was time to return to the mainland. It goes without saying, that the journey back went by so much faster, and soon the crew were helping us off the boat and bidding us farewell. The Sunday lunch excursion that AmaZing Venues offer is in my opinion such a great day out, and at £99pp it is very good value for money. They also offer various weekday and Saturday day trips to the fort with a similar itinerary, and if you are looking for that special night away you can also spend the night in one of the 9 bedrooms, with prices starting at £599 per night. Out of the four forts in the Solent, AmaZing Venues owns three of them and will soon be opening up a second hotel on one of the larger forts, followed by a museum on the third. Great day out and a great review. What you’ve written is certainly an accurate reflection of my experience. Fab food and a wonderful place to look around with excellent views as you relax on a sunbed after lunch! Recommended as a treat for a loved one, a birthday or anniversary. Great to hear that you also had a good day out at Spitbank Fort. Have you tried No Man’s Fort as well? That is on my to do list as well as an overnight stay at either, or both!